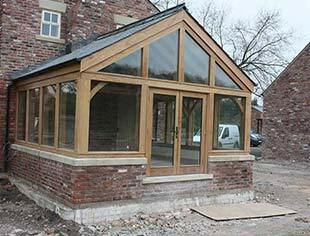 Operating in oak framing since 2006, the team here at Carvola have had some exciting opportunities come our way and have worked on various projects around Cheshire, Lancashire, Yorkshire and wider areas of the UK throughout this time. 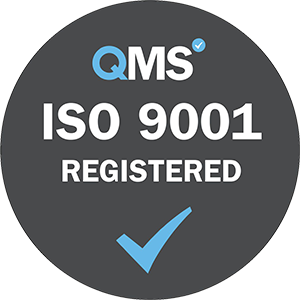 We now have a rather impressive portfolio we’d like to share with you, so please feel free to have a browse through our selection of case studies and get a feel for the type of high quality work we produce. This was a garden room frame with an air dried capping board glazing system to give an excellent quality, weathertight finish with minimalistic appeal. Facing south east, it was built to bring natural light into the house, while taking advantage of the excellent outlook. 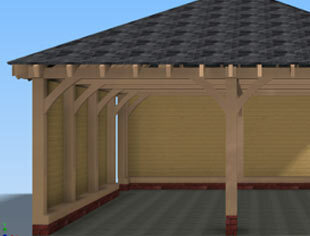 Having a garden room design with a slate roof also meant there was less solar gain, and heat from the sun in summer, while maintaining thermal values in winter. 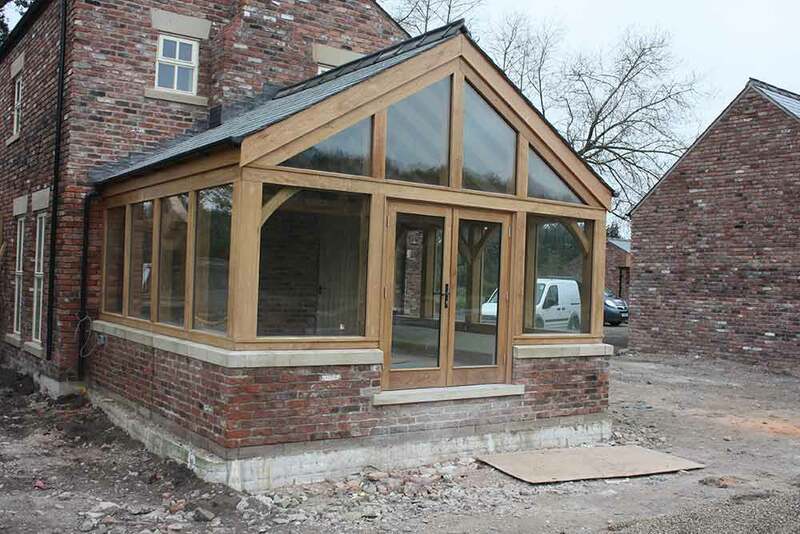 The building was designed to sympathetically fit in to its surroundings beside an old barn conversion in a farm situated in idyllic surroundings beside the river Darwen. 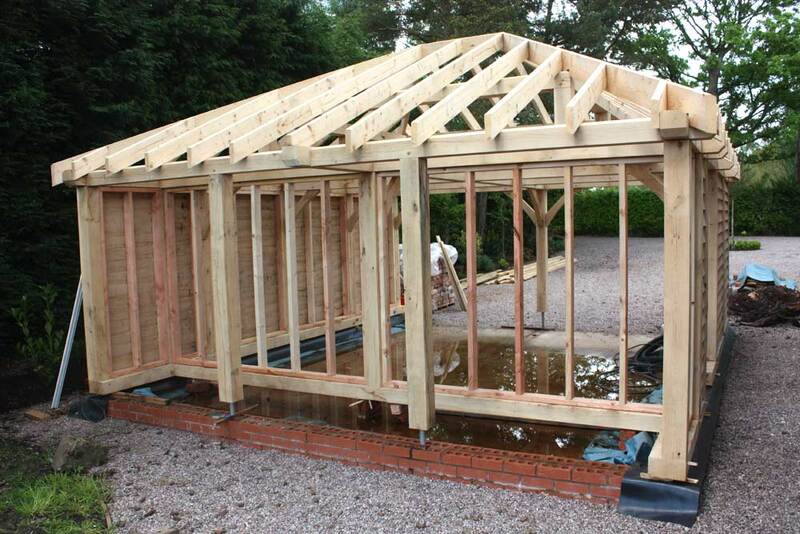 The frame was designed in CAD, and the customer and the fitter were able to consider all aspects of the frame with 3D images before fitting and approve everything. 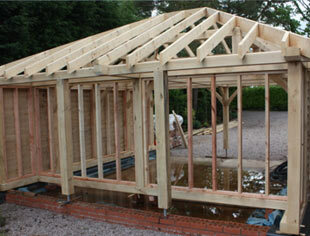 The frame all made off site, ready for easy assembly on site, and the construction only took several days to complete. Once the glazing was finished, the capping boards were fitted and the frame was given a coat of exterior UV resistant oil to give it a pleasing and long lasting finish. 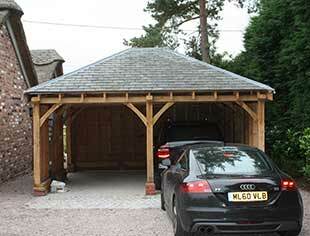 Oak Frame Garage, with Storage loft and rear storage. 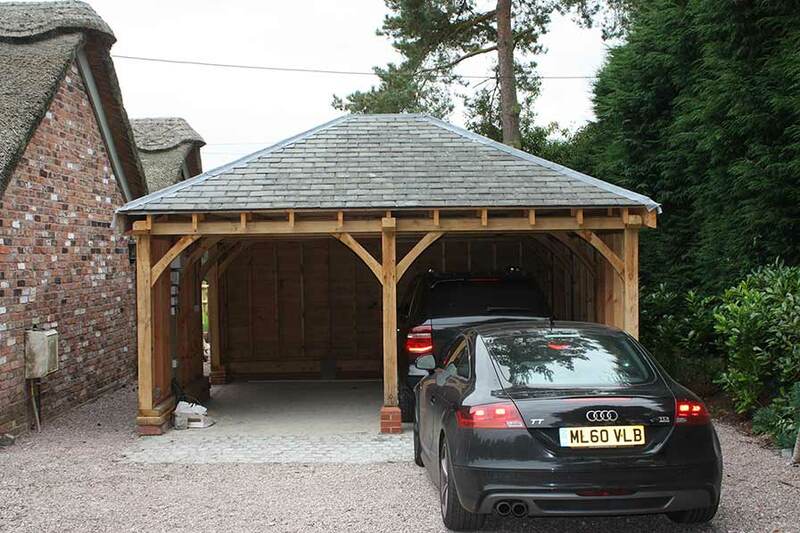 This building was created around the customer specification of needing secure storage as well as a 2 car garage. 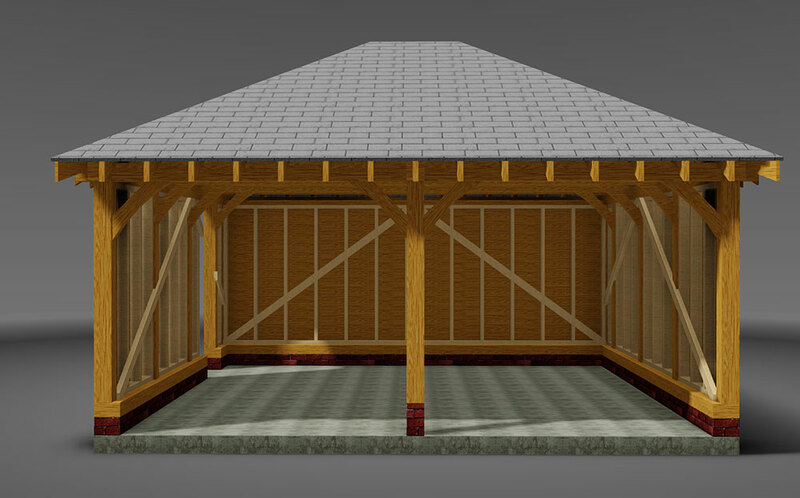 From the initial design brief we created a series of CAD drawings for the customer and builder to consider all aspects of the construction and appearance. 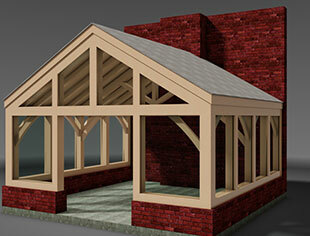 Carvalo also supplied all the roof members pre cut and shaped to fit the roof outline to save time on the project. All the ridges, rafters and jack rafters were cut plumb at the ridge and the end, and all wall plates were pre cut designed in CAD and pre machined with CNC machinery for exact and neat finishing. The roof design and finish was very important as it was constrained in height by planning permission, and had to be sympathetic to the house, which was thatched. The finished roof was made with welsh reclaimed slates.